An invitation to research ancient menhirs sends you to Brittany to find these magnificent standing stones. But you quickly discover there is far more at stake than groundbreaking research. There is a prophecy, one that foretells chaos and evil being unleashed upon the world on the night when a comet hides behind the moon and turns the sky purple. Tonight is that night. Can you race against the clock to save not only yourself, but the fate of two worlds? 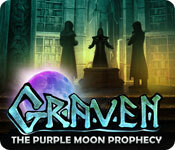 Graven: The Purple Moon Prophecy is rated 4.5 out of 5 by 99. Rated 5 out of 5 by bcorsica from The Graven I really enjoyed that game. Last forever and full of good stuff. Not going to elaborate like the top ones. I just had a great time, was challenged. Worth the money. Rated 5 out of 5 by maggler from Graven I rarely write reviews but I had to weigh in on this one. Not since I played my first Surface game six years ago have I been so absorbed! This is the best game I've played in a long time - I agree with the reviewers who say this SE puts CEs to shame! I looked for other Orchid Games immediately after finishing; sadly, there are none for now, but I hope that will change in the not too distant future! I also hope that Orchid's new games are as intriguing as this one - please, please don't give in to the formulaic; keep challenging us the way you did with Graven! Rated 5 out of 5 by megwoman25 from More Like This Please!!! Games like this remind me why I fell in love with hidden object games to begin with. Nowadays everything is so cookie cutter with soooo many repeats of the same game over and over again. Instead of making 13 in a series developers need to make games like this one!! A little thought and creativity go a long way. Yes, the plot has been done before but the game mechanics were different and hidden object scenes were special!! This is a game I will remember! This has all the bells and whistles of a collector's edition but without the hefty price tag. In fact this game is better than half the CE's I've played. There are achievements, collectibles (70 mistletoe to find and good luck finding them all-I got 62 grrr), twists on mini games that made them a bit tricky and every hidden object scene was varied. You did visit them twice but each time visited there was a different theme and they were so fun! Some you found items on a list, others were silhouettes either just finding them or finding an object and using it, others were frogs! I just loved all the variety. The only drawback I could find was that even though I checked no sparkles, there were sparkles on the hidden object scenes but honestly it didn't bug me! This played like a new game but also like an old school game and what I mean by that is after going through the game and picking up what I needed, using it etc all the locations stayed open which meant I could go back look for collectibles but then as I needed to go back to locations, hidden object scenes would pop up and lead the game and since each hidden object scene was new and varied I absolutely loved coming across so many. In newer games devs tend to remove a lot of hidden object scenes or just have a one time visit which is okay if you have boring object scenes but this game made me remember when hidden object scenes were special and it made me want to play more games like this that were out of the box and special. I highly recommend this game if you are sick and tired of the cookie cutter, 14 in a series deep games that seem to be sooo boring. This one made me really excited to know there are devs out there coming up with new ideas and I will keep buying them as long as they are creative and set apart from the rest. Rated 5 out of 5 by Demonduck from If You Loved The Mists Of Avalon Books If you loved the "Mists of Avalon" books, then I think you'll totally enjoy this game. It's not about King Arthur but you do get to sail to the hidden Island of Avalon and watch the mist part on your way to becoming a very powerful present day Druidress! 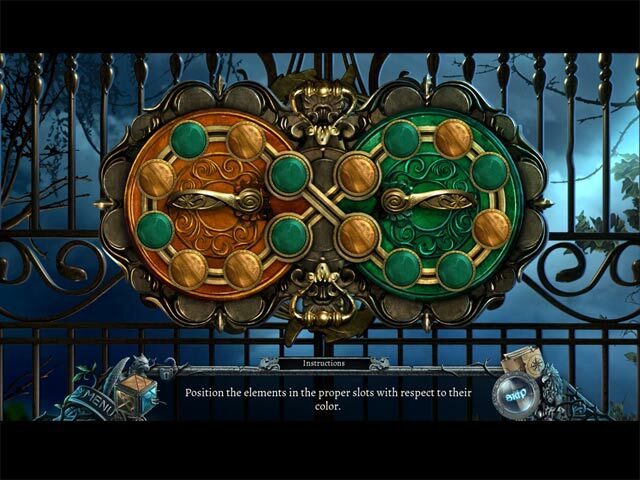 The story was very engaging and the pace of the puzzles and clues kept you moving. Most everything you find or make gets used pretty quickly, so you aren't scrolling through a ton of inventory trying to remember what area needs this item or that one. Only real annoyance was not being able to switch maps. You only have options for the area you're in, so if you need to go back or forwards a good distance you'd have to travel near that area before getting another map. The puzzles and hops had just enough of a challenge that I only skipped a couple that were a type I really don't want to spend time doing. (I'm not a fan of rotating 5 circles that have a bunch of mis-matched sections and trying to make up 5 new images or complete a color pattern.) Many of the hops did use the shadow style, and while they did take some time, they weren't really all that difficult, you just have to be patient and look closely. There's nothing that is trying to trick or deceive you per se. I was pleasantly surprised to find the SE had some of the features you usually only get with a CE. There are a couple of items that you can collect through out the game. They don't morph, but you do have to remember to look closely at every scene, including the item popups, to find the mosaic pieces you'll need near the end of the game. I do hope to see more Graven stories, and our newly empowered Druidress in the near future! Rated 5 out of 5 by queenjanis from Game I'm getting ready to try it. There was a game out years ago called the Green moon prophecy. Rated 5 out of 5 by ninja226 from Must Buy Game No need for a CE version, this is a SE with CE features. There are achievements, 70 white holly branches to find (hidden in scenes and HOS, sometimes 1, sometimes 2 or more), and 40 mosaic pieces to find that form the pieces for a tanagram puzzle that opens up a passage later in the game. The story is quite elaborate, but makes sense, and has a logical progression in the search to the conclusion. The graphics are crystal clear, sharp, and high def, including the video cut scenes, which is a nice touch. So many HO games offer high def static scenes, but the video cut scenes are done in low resolution and look FUZZY.Ugh! This is a huge pet peeve of mine in age of HD1080. The story is about Druids, which is an unusual theme for HO genre, and there are influences from Lord of the Rings saga. As much as I liked the clearness of the graphics, the human characters do look a bit humanoid and not as authentic as I would like. It's not a pretty-girly type of fairy tale settings, but also not a horror house gloomy type of game either, more foggy mystery but not scary. This is quite a long game to play. The mini games have just the right amount of challenge, most games being reasonable, and a few that frustrated me too much so I skipped. You can get Hint & Skip even in expert mode, and there are helpful messages, in all modes of play. Believe me, some of the HO objects can be difficult, even if it's the usual find fragments of objects from silhouettes. If there are any flaws to the game, it's that there is no teleport map. There is a map, but it doesn't teleport. The other thing I didn't like was the mini games do not have a Reset button, which is really helpful when you get stuck. You can cheat, as there is a BF walkthrough. Finally, the ending is quite abrupt, and I wish the devs had given the option to go back to find all the white holly branches. If you don't find them all, you have to play game again. Overall, this is definitely one of the better HO games out there that has not been serialized, and is a real gem of a game, having a well written and well thought out mystery adventure that is both fun and challenging to navigate while holding your interest as to what will happen next. Two thumbs up. Rated 5 out of 5 by Raysar from Still fantastic in 2017 This is one of the best standard edition games I have ever played, equally as good as some of the Collectors Editions. Fantastic graphics, story and many of the games and puzzles were unique and not something I have done before. Considering this was released a few years ago it is completely relevant and was exciting and unusual. I highly recommend getting this game you will not be disappointed! Rated 5 out of 5 by Namush from Awesome This is a great game, very well done, try it you'll enjoy it!! 5 stars. Rated 5 out of 5 by Pikelet from Wow - what a game! I played this based on other reviews and I'm so glad I did! It has a great storyline and graphics. 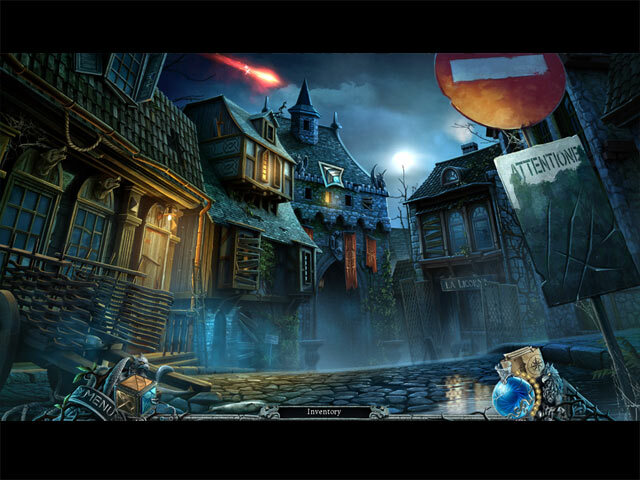 Hidden object and puzzles with the added dimension of finding hidden mosaic and mistletoe. A really enjoyable game - more like this please! Rated 5 out of 5 by rjohn82677 from Graven:The Purple Moon Prophecy WOW: Fantastic Game. The story line is outstanding. The puzzles are just great. 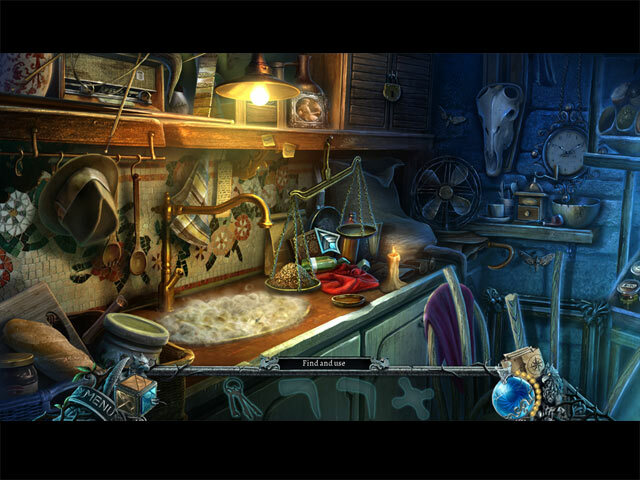 I LOVED THE HIDDEN OBJECT SECTIONS, BECAUSE FINDING THE OBJECTS REQUIRED ADDITIONAL WORK. I purchased this game with my Free Game Coupon, but it would have been worth purchasing at full price. I did not know how the game would end, but the climax was RIP ROARING GREAT! An unexpected invitation sends you to research mythical standing stones in Brittany.